Because I have had some questions, I dug up a post from one of my old blogs about the house and the ghosts 🙂 I updated it a bit as well. The house is haunted by at least three ghosts. A little bit about the history of the house . . . . . Okay I donâ€™t know much about it. It is a Craftsman Cottage and was built in the early 1900s. However the house next to it dates back to 1631 (I know this cause they have a little signpost saying so) and the house across the street, the BF’s family house, is an old Quaker house, so itâ€™s pretty old too (1700s). Anyways the one known ghost is a teenage boy who used to live here. His name is Michael something, I forget the last name. He committed suicide. He didnâ€™t do it in the house though, he did it outside in his car (carbon monoxide). He haunts his bedroom upstairs, the guest bedroom. He also wanders around the house every now and then. The creepy thing is, he used to date the BF’s sister and was the BF’s brother’s friend. He’s very acting when the BF’s brother is here. Generally he just makes the environment really really cold, sometimes he brings a breeze with him. Princess doesnâ€™t seem to like him, when he comes around she growls. People have tried to get him to â€œcross over into the light,â€ but for some reason he doesnâ€™t want to go. For whatever reason he doesnâ€™t want to leave. When I moved in we made a deal, he could stay and do as he pleased as long as I didnâ€™t have to see him. Yes, he has been seen by others! Unfortunately the other day I think I got my first glimpse of him out of the corner of my eye. The other two ghosts are actually small children, and it is believed they may haunt the house next door or a house that may have possible been here at one point. Nobody knows much about them. They have been seen, once as a reflection by a former house tenant. You know when they come around. They like to chase the cats, and the cats go nuts when the kid ghosts come to play. They also have a habit of playing with clocks or anything digital. The kids donâ€™t seem to sleep as they often come late at night when nobody is downstairs. You can hear the cats running all over the place, and sometimes you can hear giggling! One night the BF and I were upstairs watching TV and a laughing sound could be heard downstairs! I asked what that was . . . he said either the cats or the ghost children. The ghost children was the wrong answer! This is a picture of the upstairs of the house and the two bedrooms. The bedroom on the left is the guest bedroom where the one ghost dwells. I took this photo late one evening after the sun had set. It was actually pretty dark upstairs, so there wasnâ€™t any odd sunlight to cast reflections or make weird things happen. Notice the orb in the doorway! Yeah yeah, it could just be a particle of dust or a drop of moisture in the air. 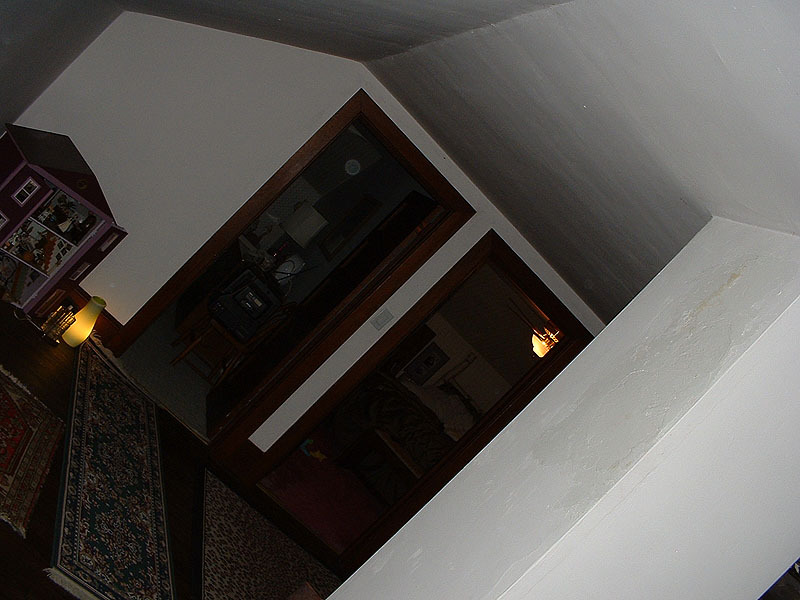 However click on the photo to enlarge it and look closely at the orb. Is that a face in it? I have looked at the photo full sized and the face is there, it is not a re-size/sampling fluke. This entry was posted on Saturday, April 28th, 2007 at 10:35 pm	and is filed under Paranormal Stuff. You can follow any responses to this entry through the RSS 2.0 feed. Both comments and pings are currently closed. You know I love a good mystery, and ghosts. Since I have my own share of them throughout my life. If the children (souls) hang around, they must be grounded to the location if they choose not to cross over. For some reason, I find that souls who take their lives do not cross over very easily even when invited. I’m sure they set the pets off when they visit. I’ve been the ‘medium’ in my family since I was a kid. The family, it seems always comes back to me for some reason. My grandmothers, and my mother have visited me here occasionally. Your situation would make for some great table tipping, and the fact that they are connected to living people who reside in the house (the BF and extended family). Maybe they like the house and they are protective over that space. Even as well, the land those houses sit on in that area has a lot of spiritual energy connected to it. I get a sense that they are connected to more than the house. I can totally see the face in it…that’s so cool. What an interesting story. Who doesn’t love a good ghost story? Our house was built in 1904 and it has a ghost too. Just one though. We’ve gone to the library and done tons of research, but we can’t seem to figure out who it is. We know its a he and he doesn’t appear too often, but when he does the pets let us know! He’s done some really creepy things, though so I’m not a fan.